History During the invasion of Sicily, USS Maddox (Lt Cmdr Eugene Sylvester Sarsfield) was pounded by two 250 pound bombs by a lone JU-88 bomber. One struck the magazine and the other struck the rear No. 5 gun turret. The magazine demolished her stern and then the Maddox rolled over and sank in two minutes south of Licata, Sicily, Italy in position 36º52'N, 13º56'E. 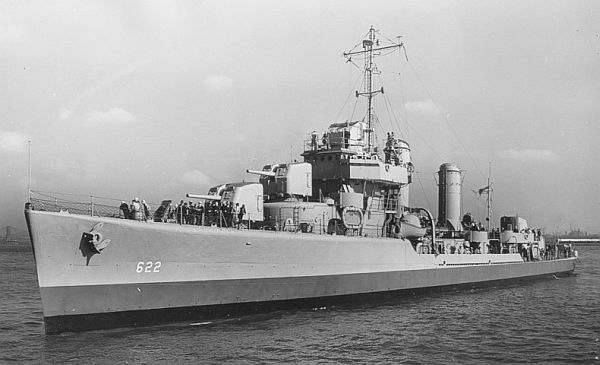 211 of her crew were killed including the Commanding officer and 74 survivors were picked up by the USS Intent which was near-by. While employed in offensive operations off Mindoro, P.I., the MADDOX was attacked by a Japanese plane, identified as a Zeke, which made a suicide dive into the starboard superstructure. Damage caused by the simultaneous explosion of the plane and estimated 100 pound bomb which it carried was severe. 8 Casualties were suffered as result of burns or shrapnel wounds. Transferred to Taiwan 6 July 1972 being renamed Po Yang.